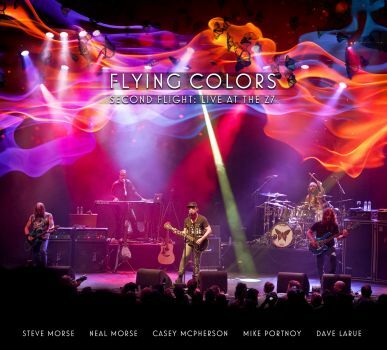 FLYING COLORS [STEVE MORSE, MIKE PORTNOY, NEAL MORSE] - SECOND FLIGHT: LIVE AT THE Z7 (2CD+DVD DIGI) | Online Shop | Wizard LTD. Album: "SECOND FLIGHT: LIVE AT THE Z7 (2CD+DVD DIGI)"
fusing complex music with mainstream songwriting. Teaming the talents of such heavyweights as guitarist Steve Morse (Deep Purple, Dixie Dregs), drummer Mike Portnoy (Transatlantic, Winery Dogs, ex-Dream Theater), keyboardist/singer Neal Morse (solo artist, Transatlantic, ex-Spock’s Beard), bass wizard Dave LaRue (Dixie Dregs, Joe Satriani, Steve Vai), with new pop singer/songwriter Casey McPherson, the band quickly established itself as one of rock’s most dulcet enigmas. In 2014, on the 8th show of their fall tour, they took to the stage at Switzerland’s storied Z7 venue, and on film, captured a breathtaking live performance. With their critically acclaimed sophomore album Second Nature out for only a week, the concert recorded an exceptional rarity: band and audience, together, discovering an album for the first time. That freshness is palpable in every frame of this HD Blu-ray/DVD release. With such high quality, you are transported there and become part of the event with every crowd reaction. Flying Colors also explored technological innovation with the album, with unique ways for fans to experience it. Viewers can listen in 5.1-surround from the two best seats in the house: at the soundboard, or in the front row. For audio-only listeners, a specialized encoding process brings the full surround mixes to headphones as well. All the show’s audio was processed with a new engineering system, developed specifically for live at the Z7, which creates stunning detail and separation. The video was mastered by famed special effects company, Cinnafilm, using their revolutionary dark energy technology (Star Wars, IMAX). The result is unparalleled realism from the concert’s 24 cameras.